I commend you on going through with this and doing a fine job of it. I know it was tougher than some might know. Congrats on the relief of returning to the good ol' good ol'. Congratulations on hitting the finish line, and hitting it in style with a great cartoon. I kinda feel like going bowling now too and I hate bowling. Zelda is a pretty good way to end the challenge. Z is for Zetsudai ... you deserve to read this! My cat Zelda was named after the character in your comic and my cat is on my blog today. Do you think were are in some weird vibrational harmonic cycle with each other? Do you feel like eating pie too? Zelda is definitely a strong finish. But I'm sort of shocked by the cartoon: She has to rescue HERSELF??!! What the--!! Ha ha ha!!! LOVE LOVE LOVE it!!! I played the game years ago when it first came out in Nintendo. This just cracks me up. What?! 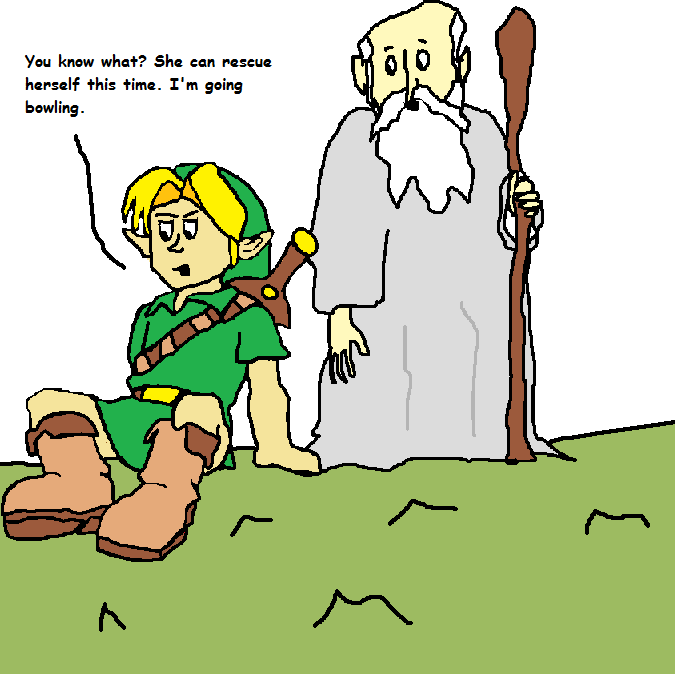 You have to rescue Zelda!! Congrats on completing the A to Z. There was no way i could have kept up with that without adopting a hate for writing afterward, but you made it through with flying colors and ended it with Zelda. Zelda's not going to save the princess?! Well then that would be a pretty short game. Leave your hut, meet a few people, talk to the Deku Tree, and return to your hut. Hmm ... not quite as enthralling as other games. Oh, wait. 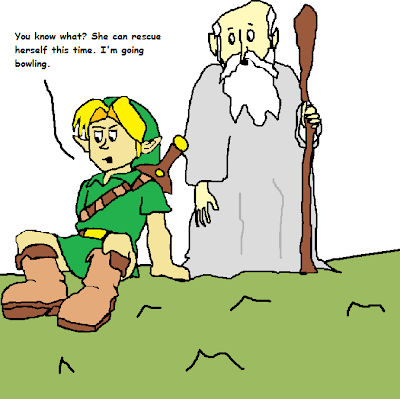 You were proposing a Zelda bowling game, weren't you? Oops. Missed that. Sorry.